Surely anyone hearing those words from a loved one would react as I did: a sharp intake of breath, a lump in my throat thudding into the pit of my stomach, palms sweating. Whatever pronouncement would ensue, a reassuring hug would not be imminent. My 25 year-old daughter, Emily, was in Cochabamba, Bolivia for the month of July, volunteering as a medical assistant at a local clinic. Bolivia. Three long plane flights away. Although I deeply admire my daughter’s altruism, to say that I was less than thrilled is putting it mildly. I pointed out the litany of negatives: poverty, diseases, unsanitary conditions, political unrest. Was there political unrest? I wasn’t sure, but I went with it. So she launched into a full-court press, peppering my inbox with upbeat articles about up-and-coming Cochabamba. Even the venerable New York Times had touted the area as a “must see” for adventurous travelers. I still wasn’t convinced. Just scanning the list of recommended vaccinations gave me the willies. This is, in fact, what she was calling to tell me. She got bitten. But not by a bug. Dear reader, do not apologize for suppressing a giggle. I confess to a fleeting notion, a teeny tiny thought in a remote recess of my brain, that there might be an element of humor in this scenario. But that impulse quickly gave way to panic. My mind was clicking as I began to ask questions and process what needed to happen. Does it hurt? Not really. Did you see a doctor? No, there weren’t any doctors. Did you get any medical attention? I went to a pharmacy and got antibiotics. When can you leave? As soon as possible. I told her to start packing while I called the airline. of noisy kids — hiked on its trails. 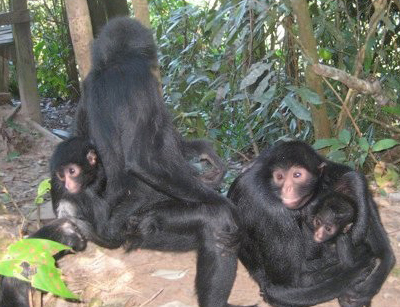 Monkeys roamed freely and, accustomed to the sounds and movements of humans, interacted calmly with the visitors. Until my daughter arrived, that is. 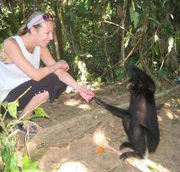 What turned this serene simian into a pernicious primate was likely Emily’s decision to crouch down to monkey eye level. With a monkey mama and baby nearby, this was a Bad Idea. SCREECH! SCREECH! The monkey alarm system was activated. As if in a scene from a horror version of The Lion King, an alpha monkey grabbed a tree and started shaking it violently. A hush shrouded the onlookers. The only sound was the ominous rustling of leaves. Monkey minions lurking nearby looked up with interest. One by one, they muttered their displeasure. The chattering intensified. Emily’s monkey friend, just a couple of feet away, bared his teeth in a fearsome grin, lunged toward her and sank his teeth into her calf. She screamed. He gripped her leg. She tried to pry him off. What seemed like hours was probably less than a minute, but he finally released her. They glared at each other (another Bad Idea, for those of you who might be in monkey company some day). She backed away and slowly headed down the trail. Her attacker followed for a few steps, then thought to leave well enough alone. He probably strutted proudly in front of his bare assed buddies back at the ranch. At times like this, you think about what could have been, and you are thankful for escaping with minimal damage. I was able to get my daughter on the next plane home. It was a grueling journey, but she was seen by our local doctors just 48 hours after the incident, and except for the painful rabies shots she endured, with more to come, she is doing fine. Despite everything, she has fond memories of her sojourn in Bolivia. And now … we can all smile.